Teacher Lee Briggs on technology in today's classroom. Brought to you by Weekly Reader. A few years back, Flip Digital, the company that created the iconic Flip cam, was purchased by electronic giant Cisco. Cisco, more commonly known as specializing in networking equipment, was hoping that that the simple-to-use Flip cam could be adapted and allow users to teleconference and post video straight to their blogs. So about a month ago, Cisco pulled the plug on the Flip camera. Why? The answer had to do with the big picture. You see, the Flip does one thing: video. Its ease of use was the main idea behind its design and software. Smartphones and tablets, on the other hand, do video as well, but they also do a million other things. Smartphones and tablets are more popular and more profitable than the uni-tasker Flip cam. Lo and behold, the powers at Cisco killed my beloved little camera. 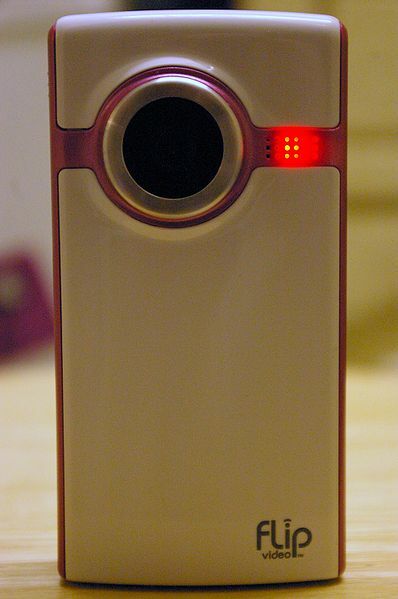 Most of the teachers who have used them loved the Flip camera. The fact that they only did one thing was part of their appeal. You could hand them off to students on a field trip, give them to a parent, record a student reading, or any number of other activities. A smartphone does all of those things but most smartphones are ill-suited for casual school use. Alas, what we do? Thankfully, with the loss of the largest player in the entry-level camcorder market, plenty of other options are stepping up to fill the void, such as the Kodak Playsport. This camera not only films video as well as the Flip, but is also waterproof (and therefore field-trip proof). I hope to get one soon and put it through the paces. Google Forms Save the Day! I love Google Docs. Even if all of my stuff is sitting on some server in California (sweet, warm California…), I like cloud computing’s ability to solve a lot of problems. 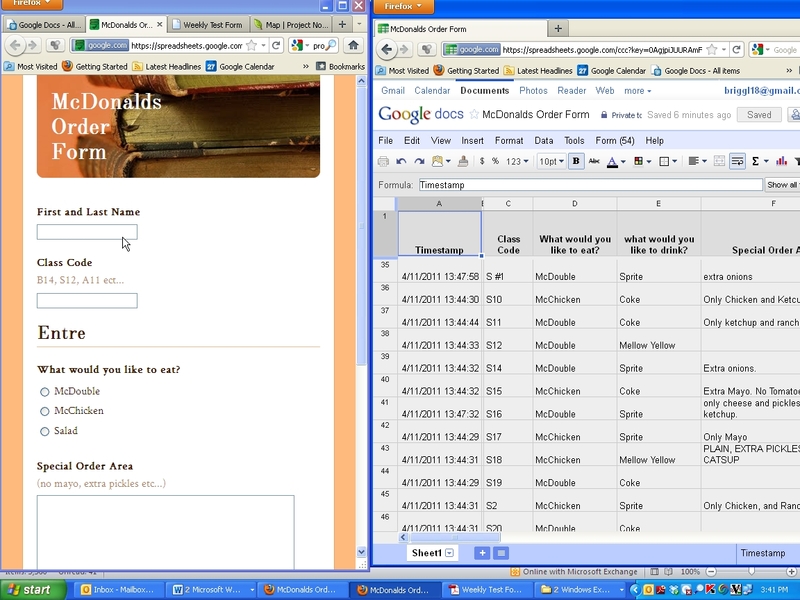 Last month I found a great use for Google Forms. Google Forms, for those that don’t know, allows you to create forms on Google Docs that can be posted, emailed, or embedded into websites. All of the information put into those forms gets dumped into a fancy spreadsheet easily organized for your use. This came in handy on our last field trip to Madison. We planned to stop at McDonald’s for dinner. We wanted to keep costs and wait times down, so we needed a simple way to get all of the orders in. Now, a normal person would just have the kids fill out their orders on slips of paper or make a order form for them to use. But I am an exceptionally lazy person and came up with a way to save myself some trouble. 1. Set up a form in Google Documents. Include all the choices you want the students to have. Remember to include names and some kind of code to confirm that the student is who they say they are. Remember, this form is public. 2. Post a link to the form on your blog or website, or email it to your students. 3. When all the students have filled out the forms, fax it on over to the restaurant of choice so that they will have your order ready when you get there! Click to see a larger version of the form. I just used this for an order form, but imagine how quickly you could get contact info, surveys, or any number of other information-gathering tasked handled easily. I recently saved a lot of paper by having my students take a test through Google Forms. When combined with conditional formatting, I was even able to make the incorrect answers automatically show up in red. I’m sure someone out there who is handy with Excel could even make the form grade itself. 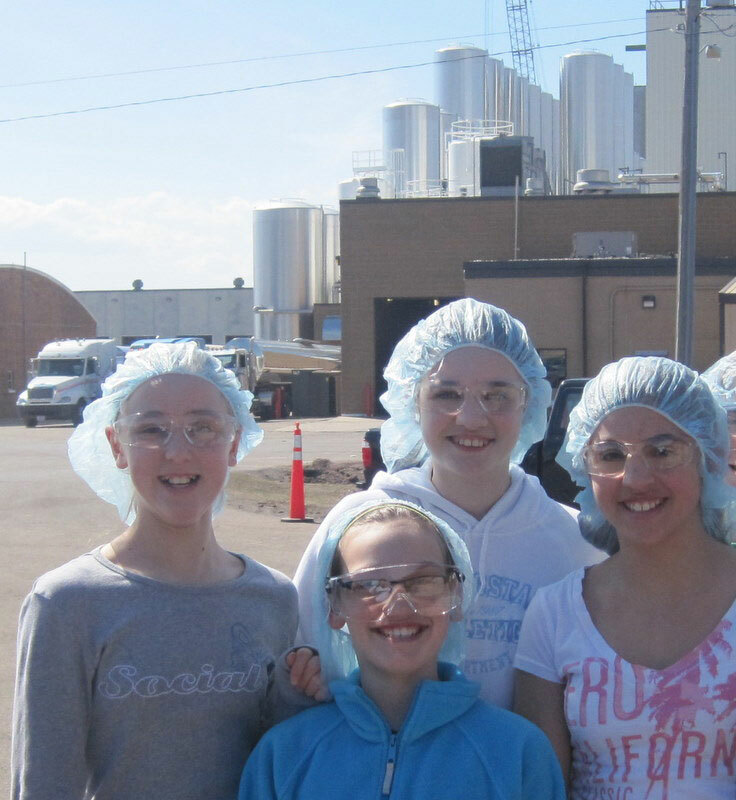 My gifted and talented students went on a field trip to Grassland Dairy, located down the highway from Greenwood. This local factory supplies much of central Wisconsin with butter. They make, process, package, and ship massive amounts of the stuff for many other companies around the country as well. If you had butter on your toast this morning, chances are good that it might be Grassland Butter. Grassland is also home to a massive automated packaging system, complete with several large robotic arms and miles of conveyer belts. It was the robots that brought my kids to the dairy. For many of them, to see these massive and complicated machines in action gives them an idea where technology can take them and how it affects us even locally. Ready to see technology at work at Grassland Dairy. The people at Grassland were happy to show us around and explained to my students how all of the incredibly complicated parts of the factory work together. One of my students, a fourth grader who built a robot that sorted LEGO bricks by color, said, “That box sorter works just like my machine!” We all were floored when we saw that the robot arms that load up boxes without fail are all programmed to within 1/1000 of an inch. “We are going to need to learn our math,” remarked another student. Look at your local businesses. There is tremendous, real-world application of technology right under our noses. Think of the math involved in stocking a grocery or running a restaurant. The student who loves cars but won’t work on his math might have a change of heart if he is taken to an auto body shop to see just how much of the job is ordering parts and making estimates. Just think what your class could learn from the workers in your community if you take them off campus from time to time.